Anybody able to show some good ways to hide the mass of wires and help with what are the better ways to dress that area up. Lot's of tight rides here...like to take some of the ideas. Cut. Splice. Solder. Shrink wrap. It's a PITA - but you get to run the wiring any way you want then. It's a fun way to spend a weekend day. There's no specific way to do it, you just run everything inside the frame instead of outside. Shorten sub harnesses for the gauge, headlights, etc. I want to keep the harness intact as much as possible, the wife will get it when I find something bigger (750 or bigger) and she might want the fairings back on it. Wants to paint it "Pretty". Well, you should be able to run the wiring still inside the frame. Unplug stuff, and get the harness inside, see what you can do with it. I appreciate the input, Conrice. I checked out you project, that VFR swingarm is sick. Got in some practice moving wires around today cleaning up under the seat. 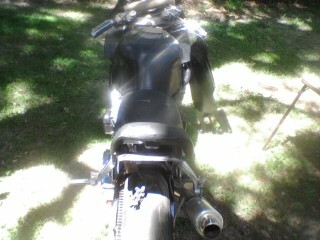 I don't like how wide the seat is, especially without the fairings, but my 43 yr old a$$ needs some real padding. I had an old atv seat laying around and started cutting on it. If I turn it around backwards it looks like a two-seater with kind of a bopper tail. I think I might try it for a while, certainly much more narrow. Ah man! Post some more pics! That is looking good, but what seat is that? The F2/F3 is kind of hard because of the rear frame. Are you planning on running those tail fairings again, or no? If not, you could try moving some of the relays and what not up underneath the tank. Of course, that would probably require soldering. I seem to remember someone making a bigger box underneath the seat and stuffing everything in there. Streetfighter wiring hiding help on my F2.